We can’t get enough pumpkin this fall. We started with pumpkin Nutella bread, it didn’t last long so we followed it up with pumpkin chocolate chip bread. My craving still wasn’t fulfilled, so I made a batch of pumpkin granola. I was unpacking our kitchen and came across several cans of pumpkin-I stocked up in case there was a shortage again. My pumpkin craving suddenly came back, so I baked pumpkin cinnamon streusel muffins. My favorite spice is cinnamon-I can’t get enough. Pumpkin and cinnamon go perfectly together, so I added a special cinnamon brown sugar filling to the middle of these pumpkin muffins. I also added a cinnamon streusel on top. 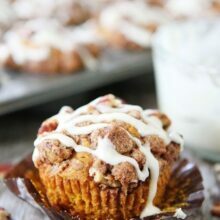 See, I told you I like cinnamon:) These pumpkin cinnamon streusel muffins are the perfect fall morning muffin. Enjoy! 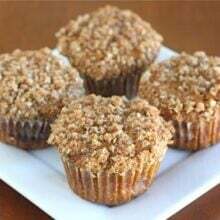 Moist pumpkin muffins with a sweet cinnamon streusel topping! 1. Preheat the oven to 350 degrees F. Line two muffin tins with paper liners or spray with cooking spray. Set aside. 3. In a large bowl, whisk together sugar, oil, water, pumpkin, eggs, and vanilla extract. Whisk until smooth and combined. 5. For the brown sugar cinnamon filling: in a small bowl, mix the brown sugar and cinnamon together. Set aside. 6. For the streusel topping: in a small bowl mix together the oats, flour, brown sugar, cinnamon, and nutmeg. Mix in the butter with your hands until the mixture is crumbly. 7. Fill muffin cups half way full with the pumpkin batter. Sprinkle the brown sugar cinnamon filling over each half filled muffin cup. Fill the muffins cups with the remaining batter. Top each muffin with streusel topping. 8. Bake for 17-20 minutes or until a toothpick comes out clean. Remove pans from oven and cool on a wire rack. Remove muffins from tins and enjoy. Chocolate Chip Pumpkin Muffins from What’s Gaby Cooking? I don’t have access to pumpkin where I live so is there another fruit/veggie I can substitute for this? It looks wonderful and happy fall! Katie-you could try butternut squash. Pumpkin and streusel – SOLD!! I haven’t eaten breakfast yet…think you can send one my way! Mmmm, scones sound good too! I wish I had one of these for my breakfast Maria! They sound amazing and I adore a streusel topping on a muffin. And you can never have too much of pumpkin or pumpkin recipes in my opinion. It was so great meeting you last weekend. You are such a sweet and beautiful person, both inside and out. Hopefully next time we’ll have more time to chat. You are so sweet. I hope we can meet up again! Yummo!! Come on over for breakfast – but you better bring these muffins too 🙂 everything pumpkin is always in season over here! These look so delicious. Streusel gets me everytime. The filling and streusel are a fantastic way to boost the flavors of these muffins. These will be added to my baking rotation. Wow – these look so good. I love streusel topping, but the addition of the brown sugar filling! I can’t wait to try these – I know they will be devoured in my house! Thanks for the great recipe. Oh Maria, you’ve out-done yourself 🙂 YUM! These look wonderful! I love all of the creative ways pumpkin is being used by bloggers this season, and this is one recipe I definitely want to try! Thanks for sharing! Mmm…I love cinnamon too. Just had to replenish my supply *again* from Penzeys last week. Muffins sound perfect this morning – yay for pumpkin baking! Oh my goodness…these look amazing. I have 5 cans of pumpkin waiting to be baked this weekend. I think I’m going to make this recipe. I love the topping! Another gorgeous pumpkin recipe!! Loving this one! wow, I am always amazed by your baking abilities. These look fabulous–all warm and cozy! I just finished my granola batch and I’m ready to try your pumpkin granola. This weekend, I hope! Gosh, my breakfast sure would be complete if I added these muffins! Cinnamon is my favorite spice too! Have you tried ordering cinnamon from Penzey’s? Their cinnamon is the best! I agree – no such thing as too much cinnamon OR too much pumpkin! These look delicious. Yum! I love streusel topped muffins! Pumpkin and strusel, two of my favorite things! I do love pumpkin, but I love streusel even more! These would definitely be a favorite in my house! Certainly ’tis the season for pumpkin, isn’t it? Love your idea of putting the brown sugar filling in the middle with the streusel on top. Cinnamon-y goodness in every single bite. Favorite spice and veggie too! Fabulous muffins and I love the streusel! I’m with you Maria – I’ve been baking with pumpkin like crazy this fall and I still have so many more recipes I want to try! Your muffins sound delish! I just made these! 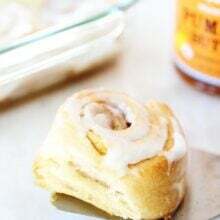 WONDERFUL, perfect blend of pumpkin, cinnamon and brown sugar! I ate one right out of the oven, I can’t wait to have them with coffee in the morning 🙂 THANKS! Emily-they are extra tasty right out of the oven:) Glad you enjoyed the muffins! It is blustery here in NY this morning – these would be perfect with a hot cup of coffee! I’m with you and I can never get enough pumpkin at this time of year. I have a pumpkin curry soup on my blog you might also like. Those are some terrific looking muffins. Wow! These look delicious! I love the idea of using oats in the topping. These look delicious. I am always looking for new ways to use the pumpkin I’m hoarding. I think this is a great start! 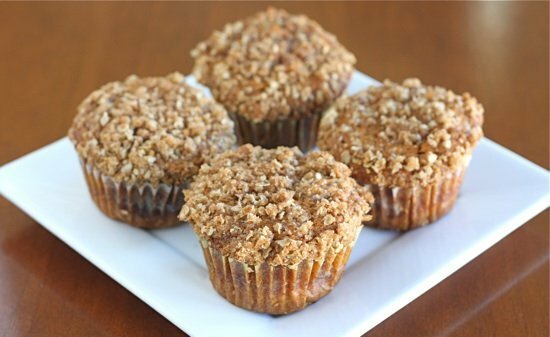 Great muffins… you can’t beat streusel topping! Courtney-Yay! Glad you enjoyed the muffins! Oh yum! I’m so not tiring of pumpkin yet either 🙂 Thank goodness! And these look fabulous.. Love the streusel topping!! I can’t get enough cinnamon either! In fact my cousin told me last night that he hated it and I was speechless! While I’m here I wanted to tell you that you won the finlandia cheese giveaway on my blog. yay for you! Just email me with your address and I’ll send it right out. These pumpkin muffins look awesome! Great minds think alike – I have to try this recipe! I can’t get enough pumpkin either… I’ve been making lots of pumpkin goodies. These muffins look perfect! 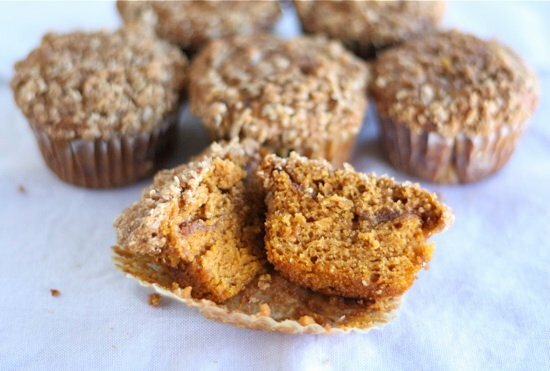 Love love love pumpkin and these pumpkin muffins are no exception! These look delish! I’ve just learned a fabulous trick to make your muffins rise higher and larger…heat your oven to 500 degrees F, place your muffins in then reduce heat right away to desired setting. (I like 400 degrees and reduce the baking time….) You’ll get higher tops on your muffins and a lighter, less dense muffin! Yum! Love your blog, make stuff from it all the time. I made these tonight! I’ve been looking forward to a free evening to make these since you posted them. I was in a rush at the grocery store and totally made the amateur mistake of purchasing the pumpkin pie mix instead of the pumpkin pie puree. I thought for sure they would be a complete tragedy, but they still tasted good just super sweet. I’m thinking that the when recipes called for canned pumpkin they mean the 100% puree. I made these this past weekend for my sunday school class and everyone loved them!!! I didn’t know how much streusel to put on top so I didn’t put that much and had lots left over, next time I’ll be adding more. They are amazing!! for the streusel, what kind of oats do you use? quick oats or old fashion? i want to make these for thanksgiving this year, i lost my original pumpkin muffin recipe and this is the only one i’ve found worthy of taking its place. For this recipe, I used quick because I ran out of old fashion. Either will work! I just put a batch in the oven – but I was only able to get 12 muffins – I don’t know how you can get 24 unless you make them very small. I have standard muffin cups. Thanks for recipe. These were incredible. My entire family loved them. I’ll be making these again and bringing them to a light brunch gathering with girlfriends. Thanks so much! Maria, I just made these muffins this weekend, and they are down-right the best muffins I have ever had in my life. They just melt in your mouth, even three days later. I have been having them for breakfast with coffee or milk in the morning and they are just scrumptious. My fiance also has been raving over them and says they are the best thing I’ve baked. Thank you for much for sharing. I will be making these quite a bit since they are a hit everywhere. Planning on making more this weekend . Yum! We love these muffins too. They are perfect for fall. Glad you enjoyed them! looks delicious. Love the brown sugar cinn filling with the streusel too…..i bet these are amazing. …So so awesome, these muffins have addressed my pumpkin craving…A keeper 4-sure! I was lazy and so I did not do the filling (instead added a bit more sugar and cinnamon to the batter). Had tons of streusel left over, so I am going to have to make it again, to the delight of my roommates. I loved these muffins, altered the recipe a little and featured you on my new blog The Mommy Press with full credit. Thanks for the recipe we really enjoyed it! This is one of the best muffin recipes I have ever made! I am allergic to dairy so I substituted coconut spread for the butter in the crumb topping. I also used half whole wheat flour and cut the oil in half by using applesauce. AMAZING recipe. Thank you! Made these muffins today, and they were delicious. These were sooo tasty!! I did omit the filling and used extra flour instead of oats for the struesel topping. The muffin it’s self was easy to make and puffed up beautifully. I wish you could have seen the look on my 3 year olds face and My husbands thanks! How does this recipe make 24 muffins?? I am using standard muffin tins and followed the directions, only filling each cup half full to begin with. I went along my merry way, filling 24 halves (not really thinking about how little batter was left, I have to admit) before I realized there is no way on earth I would have enough batter to cover the filling! I now get to make another batch of filling. Thank goodness for a stocked pantry because I have the ingredients to do so, but please take a look at your recipe and revise. Perhaps the measurements need to be different?? Sounds good, but has taken way more time than I allotted. Thanks for catching that. It actually makes about 14 muffins. Typo! I am so sorry! HOLY COW!!!!! These are phenomenal!!!! Even my picky 9 year old daughter loved them. And super easy to make too!! Will the topping stay crunchy after freezing? We loved these! Thanks so much for the recipe! I just made these tonight and while mine aren’t as pretty as yours, they were delicious. Good recipe! I just made these and they were absolutely fantastic!! I just made this and was wondering if anyone else had A LOT of brown sugar/cinnamon mixture left over? I felt that using all of the sugar would have made them extremely sweet . . . . Did others use it all? I also had streusel left over too . . . I was concerned that the ratio of actual muffin to the sugar/streusel would have been really off. . . I just made these. So amazing. I don’t know how long they will last! I love the pictures along with your recipes.. Do you have any muffin recipes without eggs and dairy? So I made these muffins last year, and people loved them so much I made about 5 batches and froze them for upcoming demands. I am NOT a baker, but making these is easy and people go crazy for them! I almost forgot about them this year until a lady from my church ordered 2 dozen! This is a great recipe, you MUST try it! 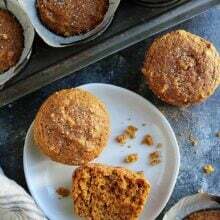 Pingback: Pumpkin Oat Streusel Muffins | Real Food, Please. These look amazing! Heading into the kitchen right now to make these delectable muffins. Thanks!!! I made these muffins in a standard muffin tin. I fill 14 muffin cups just as the recipe stated. It became pretty obvious that the muffins were over filled before I baked them. They overflowed the pan when they baked. I saw that it would probably happen and put a large sheet pan in the oven to catch any spills (which did happen). We also came to the conclusion that they were way too sweet. Sorry two peas but this recipe will not be making it into my recipe box. I think this is the first recipe of yours we have not liked. The muffins were delicious! I did cut back on the nutmeg though. It seemed to overpower the other flavors in the first batch. I have made them several times since!